Part of the holidays is sharing stories from the past and imagining what things may have been like for our loved ones. One of our supporters has generously shared a family story passed down from his mother. Please enjoy Mukilteo Daze by Neil Anderson. 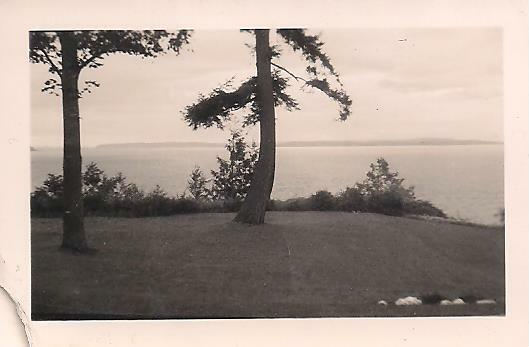 “In the 2012 summer edition of the MHS Newsline, I contributed a story describing some childhood fun-filled days at several Mukilteo beaches in the early 1960’s. Those were great times and if you happened to read the article, I hope you enjoyed it. My parents were Mukilteo kids, Rosehill students, the works. Dad was raised in old Town. My mother, Jeanne Hartley, was born in Everett, moved briefly to Seattle in the late 1920’s and then to the Mukilteo area in the early 1930’s. Her father, Edward Hartley, built a small house on what is now Taylor Drive just east of Powder Mill Gulch. At that time, the house address was Route 3, the Everett city limits were basically still at 41st Street and Mukilteo had yet to be incorporated. The small house was later replaced by a larger house which still stands today. 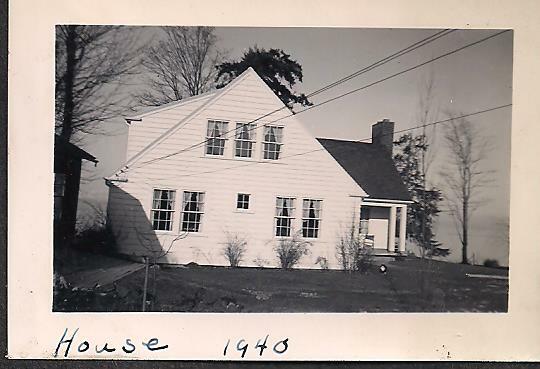 In the attached photo showing the family house in the late 1930’s, the original house (dark cedar shake siding to the left of the new house) is still visible but would soon be demolished. Dad was a typical Mukilteo youngster back in the 1930’s and 40’s. Fishing for salmon, skipping school on occasion and spending time with his pals around town. Mom had her friends, went to school, and we always thought of her as being a straight arrow not capable of doing anything wrong. We heard lots of stories from both mom and dad about growing up in Mukilteo. I’d like to share a few tales as told by my mother. She is now 87 years old with failing eyesight but her memory is still sharp. She reminisces about those days as if it were yesterday. One day around 1940 my mother along with her childhood friend Marilyn Anderson Werner decided to take a ride on the Mukilteo-Columbia Beach (now Clinton) ferry. They would have been about 14 years old at that time. A lazy day and nothing on the agenda so why not hop on the ferry for a ride to Whidbey Island and back. Probably cost a dime to ride the ferry back then. After the ferry returned to Mukilteo, they stayed up in the passenger cabin on the upper deck for another ride to the island. The pranksters were also tossing peanuts from the upper deck down onto the cars and people below. The ferry returned to Mukilteo again and the girls went back to their hiding spot for a third round trip without contributing another dime to the Black Ball Ferry Line. They thought they were pretty smart about fooling the crew of the boat and pestering the motorists below. But soon the party would be over. On the third trip after leaving the Mukilteo dock, a towering figure came up and stood over them. Mom and Marilyn turned around and there was the captain. Arms crossed and a rather stern looking fellow. The captain told them to stay put and asked where they had boarded the boat. He returned to the wheelhouse. The girls had time to now think about the trouble they might be in. It was a lonely feeling. Oh boy, their parents were going to be mad when they found out. Soon, the ferry was headed back to Mukilteo and the captain ordered mom and Marilyn to the wheelhouse. They figured there would be a serious scolding and their parents would be called after the ferry docked. Would the town marshal be called? The captain looked at the scared and shaking girls. He advised them that he had determined their punishment. It was to steer the ferry back to Mukilteo. He instructed my mother to stand up and take a place next to the giant steering wheel, place her hands on the wheel and steer the boat to Mukilteo. He instructed her how to turn the wheel and steer the boat to port or starboard. After traveling a mile or so, it was time for Marilyn to take the wheel and pilot the boat. There was some type of landmark at Mukilteo the girls were supposed to aim for. As the boat approached the dock, the captain took over and safely docked the ferry. The captain escorted the girls back down to the car deck and said good-bye. It was nice to meet them but he gave them a warning that they should not be riding the ferry without paying the proper fare. He turned around and headed back to the wheelhouse. They knew they had dodged a bullet but they knew they had learned a lesson. I can’t help thinking what would have happened if something like this would have happened today in this more complicated world. It would probably go down like this. The suspects would have been rounded up by a SWAT team rappelling from a helicopter after all ferries on the Mukilteo-Columbia Beach run went into lockdown mode. Homeland Security personnel would interrogate the suspects as to why they remained on the vessel and to hopefully determine their sinister plan. Were there explosives in the peanuts? Regular television programming would be interrupted with breaking news concerning unknown individuals hiding on a Washington State Ferry. Local news crew satellite trucks would be parked at the Lighthouse parking lot for “you need to know”” updates with live eyewitness news coverage at 4pm, 5pm, 6 pm and 11pm. Holy cow. A few years later, the country had entered World War II and mom was in high school. Things were changing and changing fast. The boys were joining the service, fighter planes were flying over the family house from Paine Field and military type ships were visiting the Everett harbor. One summer day, a ship was anchored offshore in front of the family house. Usually the ships anchored closer to Everett, but this one was anchored closer to Mukilteo and somewhat close to the shoreline. So mom and cousin Janny Hartley, decided to take two automobile tire inner tubes and swim out to the ship to see if they could do it. It took some time but they made it. It was eerie. The steel hull towered over them and made the water pitch black. They were not sure what to do next. They were tired, cold and didn’t really want to paddle back to the beach. But, as they looked up to the deck of the ship, sailors were now appearing. They were relieved. However, this was not the same reaction mom’s father, Edward Hartley, was having as he was watched from the bluff with his binoculars. He was worried, concerned and most likely pretty angry at his daughter who had just floated out to the anchored military ship in her swimsuit. Edward Hartley was once in the service too, as an officer in the U.S. Army in WW I overseas in France, he knew what trouble this could be. The sailors lowered some type of ladder and helped mom and cousin Janny out of the water. By this time, older sister Marcia was standing at the edge of the bluff waving to her sister and cousin to come back to shore. Instead, mom and Janny scrambled up the ladder to the deck of the ship. The crew had some blankets and invited my mom and Janny to the galley for something warm to drink. My grandfather was horrified to watch his daughter and niece disappear into the ship with the crew. Instead, mom and Janny were having a great time being the center of attention of the officers and crew. They were most handsome. I am sure the crew enjoyed seeing two young women in swimsuits suddenly appear on the deck of their ship. The crew was well-mannered, friendly and interested only in the safety of their two guests. The blankets warmed them up and a warm drink, tea, was served by the galley staff. The tea was so very good as mom remembers. As my grandfather paced and watched from the house, he saw a lifeboat being launched from the deck of the ship. The girls were placed in it and lowered to the water. Several crewmembers transported the high-school girls back to the beach. Edward Hartley ran down the trail to the beach to meet them and thanked the crewmembers for getting his daughter and niece safely back to the shore. There would be a stern lecture later. 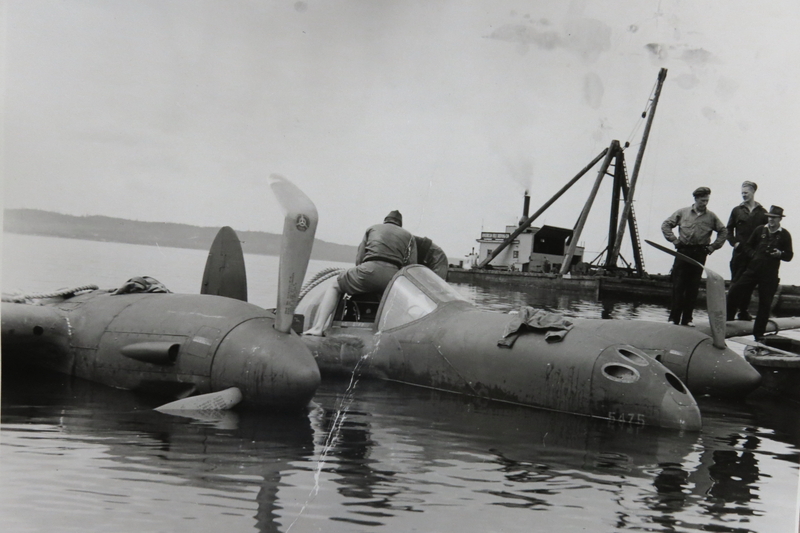 Perhaps my favorite story is the P-38 fighter from Paine Field crash landing on the beach near the family house, the year was 1943 or 1944 most likely. The middle of World War II. Everyone was helping with the war effort. Gas and sugar were rationed. Edward Hartley was an air raid warden. Lights were blacked out. One of mom’s older sisters, Judy, attended many USO type socials at Paine Field and befriended several pilots stationed at Paine Field. Judy described the location of her house on the bluff and many of the pilots made it a point to find it and fly over the house. They had great fun making low passes and buzzing the house if Judy, her friends or sisters were out in the yard. The girls could identify many of the pilots and their planes by the colors and numbers. I would guess Edward Hartley again was a little concerned with these US Army Air Force pilots in their Uncle Sam issued P-38 twin engine “Lightnings” checking out the scenery in his yard. Of course, the girls were excited, thrilled and flattered with all the attention from the pilots. One day, two P-38’s were buzzing the bluff and house, dipping below the bluff and then climbing to a higher altitude. Mom and her friend, Helen Jones, were standing in the yard watching the planes. Flying low and doing their tricks, one P-38 climbed high into the sky but the second one failed to re-appear. They remember hearing some type of “thud” sound down below. Something was wrong so they headed down the bluff trail, built by neighbor Thurston Sager, and to the beach. To the west, sitting in the sand and shallow water, was the missing plane. The pilot was out of the cockpit and standing on the wing. He was visibly upset. Mom and Harriet did not talk to the pilot but ran back up the trail so mom could tell her father what had happened. As Edward Hartley was a military man, he forbid mom and friends to head back down to the beach. Things would be now busy with the Paine Field brass working to get their plane off the beach and out of the water. All mom remembers after that is seeing a barge anchored off the beach with equipment on the deck of the barge.